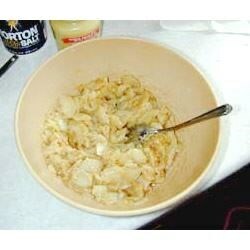 "This is an authentic German potato salad recipe. It uses very little mayonnaise, and no sugar. The flavor is amazing!" Place the potatoes into a large pot, and fill with enough water to cover. Bring to a boil, and cook for about 20 minutes, or until easily pierced with a fork. Drain, and let them cool slightly. If you wish to peel them, do it while they are still hot. It will be much easier. Allow to cool completely, then slice thinly. Place the potatoes in a large bowl. Dissolve the chicken bouillon in boiling water, and pour in with the potatoes. Gently stir in the vinegar, egg, pepper, mayonnaise and parsley. Mix in the olive oil last. Let stand at room temperature for 15 minutes before serving. This salad is best at room temperature. following the directions exactly, i found this recipe to be bland, unattractive and had a very "mayonnaisey" taste to it, even though you didn't use much mayonnaise. maybe add scallions? I am from Schwabenland in Germany and grew up on this potato salad. In this potato salad there is no mayonnaise or eggs in it. I did as Arkali suggested. I enjoyed it. Yes I did add bacon. Growing up, I had this at all family gatherings. A perfect thing they made a barques and other events. Very good. I omitted the mayo, and add more egg and a few dill pickles.